"My Uncle Terwilliger on the Art of Eating Popovers"
Ted Geisel (1904 - 1991) is, of course, "Dr. Seuss", genius of children's literature. "A person's a person, no matter how small," he would say. "Children want the same things we want. To laugh, to be challenged, to be entertained and delighted." His 1990 book, Oh, the Places You'll Go!, becomes a bestseller yet again at every commencement season. This poem was a complete surprise to the college president (whose story is attached after the speech below). Here is the background to Dr. Seuss’s unpredictable speaking engagement, as told by the Lake Forest President Emeritus Eugene Hotchkiss III in 2004. As Theodor Geisel (a.k.a Dr. Seuss) stepped forward to join me at the podium on a bright spring day in 1977, I began nervously to read the citation accompanying the degree the College would be awarding him on this occasion. Although he was listed in the program as the Commencement speaker, I was uncertain if he would accept his degree with anything more than a thank you. And thereby hangs a tale. A phone contact was made by Trustee Montgomery, who told me that Mr. Geisel would be pleased to be honored at the Commencement ceremony. 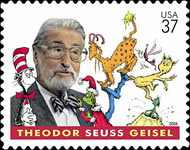 I quickly informed the Stentor, and the word was out: Dr. Seuss would be the Commencement speaker. The seniors were elated, but I was told that some faculty expressed the opinion that my choice just proved that the Seuss books were likely the last ones I had ever read! Still, I relaxed until, responding to a formal invitation I had written describing the nature of Commencement and his talk, Mr. Geisel called to say that there must have been a mistake. He thought he was being asked to receive a degree, not to talk. “I talk with people, not to people,” he declared, and if, he continued, I was proposing that he give an address, there had been a grave mistake. No, he reported just days before Commencement, he would not agree to speak. As I pondered my choices I grasped onto his statement to me, and I urged him to arrive early Friday afternoon so that he might talk with the graduates at the senior reception. And then, talking with him in person, I would attempt to persuade him to talk to the graduates, albeit if only briefly. He agreed to come to the campus as early has he could on Friday, although because he lived in California and would be flying against the clock, the odds of a timely arrival were slim indeed. The events on the day preceding Commencement were several, and each was surreptitiously extended so that the reception would be delayed, anticipating Mr. Geisel’s late arrival. Happily, shortly after the now-delayed reception began, he joined my wife, Sue, and me in the receiving line and did indeed talk with the graduates and many others, even autographing some well-loved Dr. Seuss books. Still, I wondered, would he be willing to say anything from the podium the next day? Both before and after dinner that Friday evening, I talked with him informally, hoping the influence of good wine might soften his resolve as it strengthened mine. I urged him to respond following the awarding of his degree, but he did not waiver. Perhaps the best that could be made of a desperate situation, thought I, was to announce at the Commencement that, as he requested, he had indeed talked with the graduates on Friday and to thank him for his cordiality. The evening came to an end - well, almost, for I did not sleep well that night, and I could hear the seniors partying and, undoubtedly, discussing the talk their much-liked Dr. Seuss would give. On Commencement morning, as the honored guests robed in their academic regalia, I again asked Mr. Geisel if he would be willing to say but a few words, acknowledging his degree. Still his silence was penetrating. Finally the time came to read his citation. As I reached its end and as Faculty Marshals Rosemary Cowler and Franz Schulze stepped forth to place the hood over his head, I spoke these penultimate words, for which I must credit my wife, Sue: “We proclaim you not the ‘Cat in the Hat’ but the ‘Seuss in the Noose’.” And then I awarded him the College’s degree of Doctor of Humane Letters, honoris causa. At that moment, fearing his response, I shook his hand in a whisper and asked him if he would be willing to say a few words. He reached under his academic gown, announcing loudly for all to hear that it was “a bathrobe,” pulled out a piece of paper from his shirt pocket and turned to the microphone. And the rest, as they say, is history.